Charles William was Edward’s brother. Charles had one sister, Betty Margaret Ower (b.1905 – d.27/12/1944). ‘ENSOR Betty Margaret Ower of the Old Manor Salisbury spinster died 27th December 1944. Administration London 2 December to Malcolm Stewart Maclauchlan retired captain H.M. army. Charles had another uncle, Alan Stewart Maclauchlan, who served in the Royal Garrison Artillery in WW1 and was killed in action in France on 28th March 1918. Alan’s name is also on the Cenotaph and you can read his story by selecting his name. On the 1901 census Charles is living with his parents at 175 West Street, Wimborne, Dorset. This is the address of his grandfather, John Thomas Ensor, who is employed as an Auctioneer and Farmer. Charles’ father is a Solicitor with his own account. The 1911 Census shows that the family is now living at 40 Archers Road, Southampton. Charles’ aunt Lilian Maclauchlan is visiting. Also at the address are Elfreda Beatrice Louise Bartlett (Governess), Helen Lever (Cook) and Rosa Jessie Runk (Housemaid). Charles’ father is still a solicitor working at 4 Portland Street, Southampton. Charles was living at 49 Westwood Road, Southampton when he enlisted as Private 38205 in the Hampshire Regiment on 23rd September 1916, aged 17. In May 1917 Charles was transferred from the Malvern Court Cadet Corps to the Royal Garrison Artillery Cadet Corps at Trowbridge. On 2nd December 1917 he was gazetted 2nd Lieutenant in the R. G. A. Hampshire T/F, and Lieutenant on 2nd June 1919. 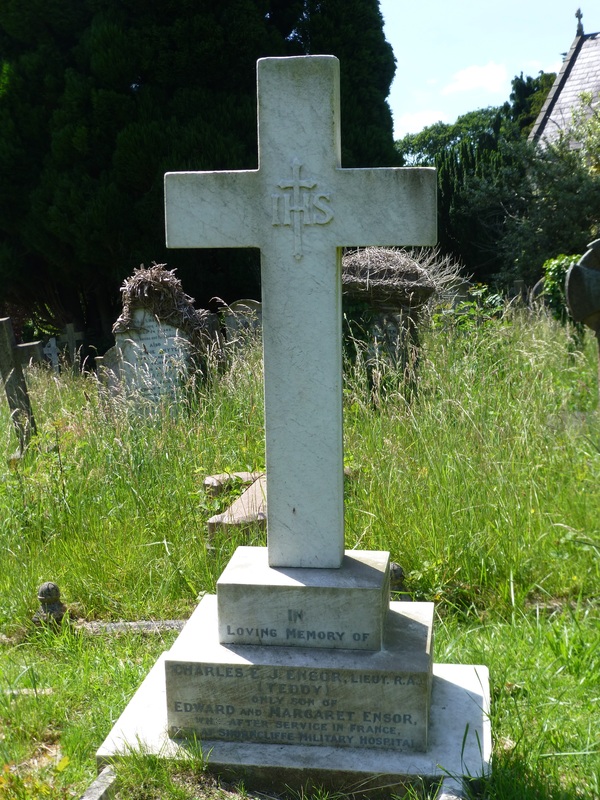 Charles died on 18th October 1919 at the Military Hospital, Shorncliffe Camp, Sandgate Kent, after serving in France. The address given in this probate was actually the business address of Charles’ father. Charles was awarded the 1914 – 1915 Star, the Victory and the British War Medals. This cemetery is on Southampton Common and was made in 1846 under Act of Parliament. It contains 99 Commonwealth war graves of the 1914-18 War, a plot of 21 1914-18 War Belgians and 15 Commonwealth war graves of the 1939-45 War.